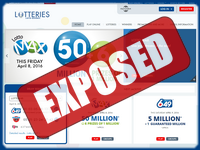 Is Loteries.Lotoquebec a Scam or Legit? Read Reviews! Originally known as Société d’Exploitation des Loteries et Courses du Québec, Loto-Québec was the first of its kind in Canada. It was also the first to set up “terminal based” lottery sales. This has evolved into loteries.lotoquebec.com that offers access to lotteries online, plus casino games and so many different types of scatchies it was hard to figure out where to start. The good news is – anyone can play! Plus, winning is tax free. Let’s go take a look. Okay this was a first – you can only purchase tickets and play games available at loteries.lotoquebec.com from 5:00 am to 11:59 pm EST – that’s Eastern Standard Time in Canada. The site goes down for maintenance outside of those hours. Now that’s a first! On the lotteries, loteries.lotoquebec.om offers players Canada’s 649, Lotto Max, Quebec 49 and their newest game Roue de Fortune Éclair. They also offer a whole bunch of different Scratchies including Scrabble, Cash Wheel, Hawaii, Rouge Passion, Snakes & Ladders, Bingo and Cash for Life – just to mention a few. On top of all that, there are also a bunch of casino games. Tickets are purchased at face value. Roue de Fortune Éclair is sorta a scratchie with a bit of extra. It’s got four game areas and one of them corresponds to a “right to spin the wheel” to win an amount between $25,000 to $1,000,000 Canadian dollars. What they do is travel around to locations giving players the chance to spin the wheel. The latest game started this March 2016 so there are lots of opportunities to win. They also offer group play. You can either join one of the existing groups or set up your own. This is very different from a lot of other sites. It’s pretty straightforward and you can clearly see what is being offered in the syndicates set up – or set up your own. Lotteries at Loto-Québec are all tax free. Players who purchase a ticket and win must sort out how that affects any tax situation in their own country. Playing online at loteries.lotoquebec.com, prizes under $25,000 are credited directly to your account. Prizes over $25,000 must be claimed in person. Loto-Québec won’t mail or send money to another country so you also have to come collect your prize yourself! You can claim your prize Monday to Friday 8:30 am to 4:30 pm. Besides a heap of snail mail addresses including their head office in Montreal, there is several email addresses (available 24/7 though I think excluding their maintenance period), toll free phone numbers and a contact for those that need help as they are lottery addicts. This is a government run site so very official. Whether you like it or not, play at Loto-Québec and you agree they can use your name and photo announcing your win especially if it is one of those amazing mega jackpots. You agree to this! Would you mind rating Loteries.Lotoquebec.com? I like the fact that purchasing lottery tickets is at face value plus winning is tax free. The threshold for what they will put straight in your account of under $25,000 is realistic. Heck, if I won more than that I’d be happy to fly to Canada to go get it! Loteries.lotoquebec.com gets a thumbs up. I don’t personally like the idea that I’d have my name shouted out loud if I won, at the same time if it was one of those mega jackpots, I’d probably be doing it! Hi. This review is not correct. The online site is only open to players with physical adress in Quebec. I tried to register, but it was not possible to go past second field. I also could not enter which country I resided in. Please update. Our apologies for not being clearer! You are absolutely correct that players cannot purchase tickets outside of Québec through this site. Players must be a minimum of 18 years of age and a clarification from Loto-Québec says you must be physically present. But, there is a bit of a gray area with the reference regarding visitors who purchase tickets. In all other Canadian provinces, visitors can purchase tickets and claim prizes for Federal lotteries. We’re seeking clarification regarding using a proxy (agent on the ground) who purchases on your behalf to play Québec’s lotteries. I misunderstood proxy Daisy. Thought you meant a web proxy to change IP address. A proxy in person is a different thing, of course. Hi. Thanks for the reply. No question that visitors can play, they can do that in most cases in other countries. Proxy would probably not be ok, if you compare to UK operator Camelot they refuse all winnings maid not beeing physically located in UK. How would I prove that I bought the ticket in the right place? forfeit a flight ticket? In this case with lotoquebec it would make no difference because you need also to register with a physical adress which is impossible.